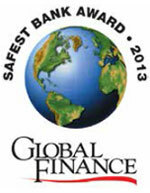 New York, August 26, 2013 - Global Finance magazine has named the Safest Banks in Latin America in an exclusive survey to be published in the October 2013 issue. Winners were selected through an evaluation of long-term credit ratings—from Moody’s, Standard & Poor’s and Fitch—and total assets of the 500 largest banks worldwide. Chilean banks dominate the list once again this year, taking the top four positions.